MLB Sets New Rules To Speed Up The Game : The Two-Way Among the changes: Major League Baseball will impose stricter limits on mound visits, and commercial breaks will be shorter. 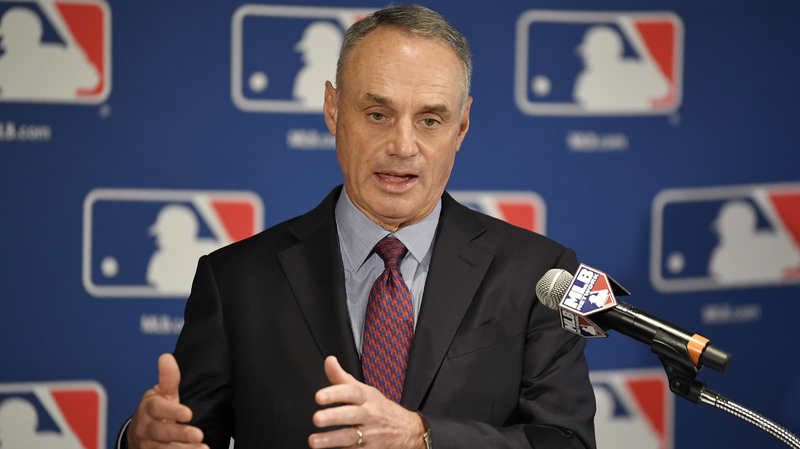 Major League Baseball Commissioner Rob Manfred speaks during a news conference at the baseball owners meetings earlier this month in Los Angeles. On Monday, Manfred announced new rules aimed at shortening how long it takes to get a game played. Starting with the 2018 season, MLB will impose stricter limits on mound visits by managers, coaches and players; however, there are some exceptions. Commercial breaks will be shorter. And pitchers may throw as many warmup pitches as they want before the commercial break ends but will no longer be guaranteed eight warmup pitches. "I am pleased that we were able to reach an understanding with the Players Association to take concrete steps to address pace of play with the cooperation of players. My strong preference is to continue to have ongoing dialogue with players on this topic to find mutually acceptable solutions." After more than a year of talks, the Major League Baseball Players Association refused to agree to the changes but also signed an agreement that it will not oppose them. "Players were involved in the pace-of-game discussion from Day One, and are committed to playing a crisp and exciting brand of baseball for the fans, but they remain concerned about rule changes that could alter the outcome of games and the fabric of the game itself." Manfred had wanted to add a countdown timer between pitches, but there will be no 20-second pitch clock for 2018. There will also be no between-batter clock. — Mound visits will be limited to six per team per nine innings. Teams will receive an additional visit for every extra inning played. Any manager, coach or player visit to the mound will count as a mound visit. — Visits to the mound to clean cleats in rainy weather, to check on an injury or potential injury or after the announcement of an offensive substitution are excepted. — Also, normal communication between player and pitcher that does not require either to vacate their position on the field does not count as a visit. — If a team is out of visits, the umpire will have discretion to grant a visit at the catcher's request if he believes there has been a cross-up between the pitcher and catcher. — As has been the case since the start of the 2016 season, a timer will count down between innings from 2:05 for breaks in locally televised games, from 2:25 in nationally televised games and from 2:55 for tiebreaker and postseason games. — The difference now is that at the 25-second mark, the umpire will signal for the final warmup pitch and the pitcher must throw it before the clock hits 20. The batter will be announced at the 20-second mark and the pitcher must begin his windup to throw the first pitch of the inning within the five seconds before the clock hits zero. — Another important change is that a pitcher is no longer guaranteed eight warmup pitches between innings. However, he can take as many as he wants within the countdown parameters noted above. The timer will start on the last out of the inning, unless the pitcher is on base, on deck or at bat, in which case the timer shall begin when the pitcher leaves the dugout for the mound. — If the final out of the inning is subject to replay, the timer begins when the umpire signals the out. The timing clock — as listed above — also applies to pitching changes, and it will begin as soon as the relief pitcher crosses the warning track. All club video review rooms will now receive direct slow-motion camera angles to speed up challenges and the resulting review. New phone lines will connect the rooms to the dugout and will be monitored to prevent their use for sign stealing. The Associated Press reports that a person familiar with the decision said all conversations on the lines will be recorded. The person spoke on condition of anonymity because that detail was not announced.